Yesterday we referred to making an odious comparison between the rock faces of the English Lake District and the soaring rock walls of Zion Canyon. We were prompted to make the comparison when invited to a picnic in the canyon: a few years ago we had attended a similar function, a birthday party to honor former BBC Radio producer and author Bob Orrell, held in the depths of the Ennerdale valley in Lakeland, with llamas grazing nearby, and Pillar Rock looming in the distance. On that occasion we remarked that with Pillar Rock as the back drop there were probably few places on earth that made for such a spectacular picnic site. Sadly Bob's earlier books about pack horse travelling seem to be out of print, though 'Blowout', a radio operators eyewitness account of a doomed North Sea oil rig, and another about the monuments of Lakeland, seem to be still available. We were pleased to learn that he completed the restoration of a boat named Amulet that he was working on when we last saw him, and even undertook a journey in her to the Western Isles that resulted in a book. It seems the old reprobate is still going strong, with another book due out about his seafaring adventures. We digress: when we first arrived in southern Utah, we were inevitably taken to see Zion Canyon, when a remark was passed about having previously seen the Alps. Although true in itself, the context is now lost in the mists of time. 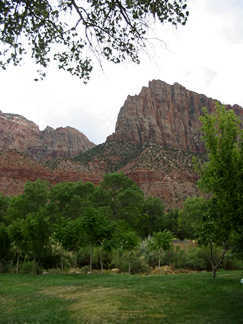 However, it seems to have been taken to indicate some disappointment with the stature of Zion's peaks and rock walls. This could hardly be further from the case. Judge for yourself. We suggest that once again it has been demonstrated that people do not actually listen to what is said, but rather to a sound bite impression of what they think might have been said. Rather than worrying about being called to speak in public, most people would be better employed by concerning themselves about being asked to listen in public. On the day the pictures were taken at the picnic site beside the Virgin River the weather was just right for the occasion: not too hot in the low hundreds, with a cooling breeze at the canyon entrance, which must be around 4,000 feet of altitude. 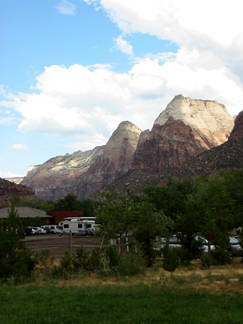 Later in the afternoon a thunderstorm developed over the mountains, which explains why the Zion heights are not seen as they usually are, bathed in glorious sunshine. On the return journey we were treated to the strange sight of torrential rain blowing across the roads, but intermingled with dust devils. We passed Grafton, the ghost town where the bicycling scene in a 1969 movie was filmed, about a local boy Robert Leroy Parker a.k.a. Butch Cassidy who had teamed up with Harry Longbaugh a.k.a the Sundance Kid. Several huge forks of lightning cracked down on nearby Eagle Crags and Canaan Mountain, followed almost immediately by deafening rolls of thunder and blasts of wind. Since that storm the humidity is still high, but with lower temperatures things have been more comfortable. More electrical storms are forecast, which can make things dangerous in the narrow canyons because of flash floods. Certain people reading this paragraph may discern that we are quite impressed by this country. American actress (1964- ). Daughter of a German opera singer and an American voice coach, she speaks and sings fluent German. Her nose was broken by her sister Gesine when they were children, and she has a scar above her eye from a fall into a creek ("I love my scar. I figure if Harrison Ford has one on his chin, I can have one above my eye. It's a guy thing. "), nevertheless in 1996 and again in 1999 she was on 'People' (USA) magazine's list as one of the 50 most beautiful people in the world. The caricature does not do her justice. Information from the IMDB (Internet Movie database) web site was used in the preparation of this biography extract. After Tony Richards published his picture of Blea Tarn in the English Lake District, one of his sharp eyed readers noticed that the hills on the horizon looked like the profile of Lakeland poet William Wordsworth (this one by Edward William Wyon is in the National Portrait Gallery). Here in the United States such things are not left to happenstance: sculptor Gutzon Borglum simply selected a suitable mountain, then between 1927 and 1941, with the help of 400 workers, sculpted the 60-foot busts of Presidents George Washington, Thomas Jefferson, Theodore Roosevelt, and Abraham Lincoln to represent the first 150 years of American history. What became the Mount Rushmore National Monument in Keystone, South Dakota, is now world famous. How about Disraeli, Gladstone, Churchill, and Thatcher on Great End?